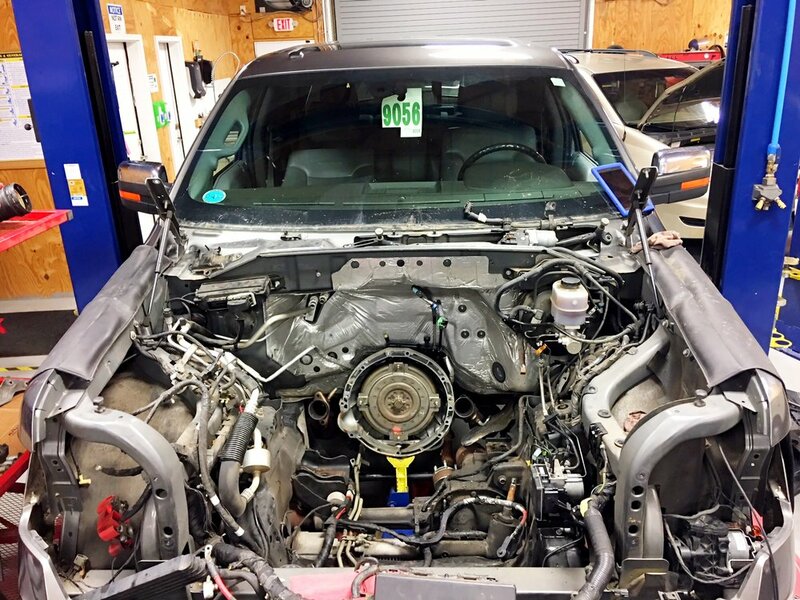 To best solve this truck's AC concerns, the evaporator core needed to be replaced. In many vehicles, like this one, the evaporator and heater cores are located inside the passenger compartment buried deep behind the instrument panel. Removing a dash to replace the necessary components, then reassembling the dash and all it's attaching pieces takes skill, patience and finesse. To read more about our ASE certified mechanics, click here. Check out the pictures below for a series showing the repair in process. A heater core in a vehicle transfers heat from the engine to the cabin, but the A/C evaporator works in a reverse manner. It transfers warm air out of the vehicle and then cools it down sending it back through the cabin. There are similarities in the two components and each needs a series of heating and cooling elements to work properly. What Does an Engine Replacement Really Look Like? With ASE Certified master mechanics on staff at all times, we have the experience to diagnose even the toughest problems quickly that many new car dealerships struggle with. 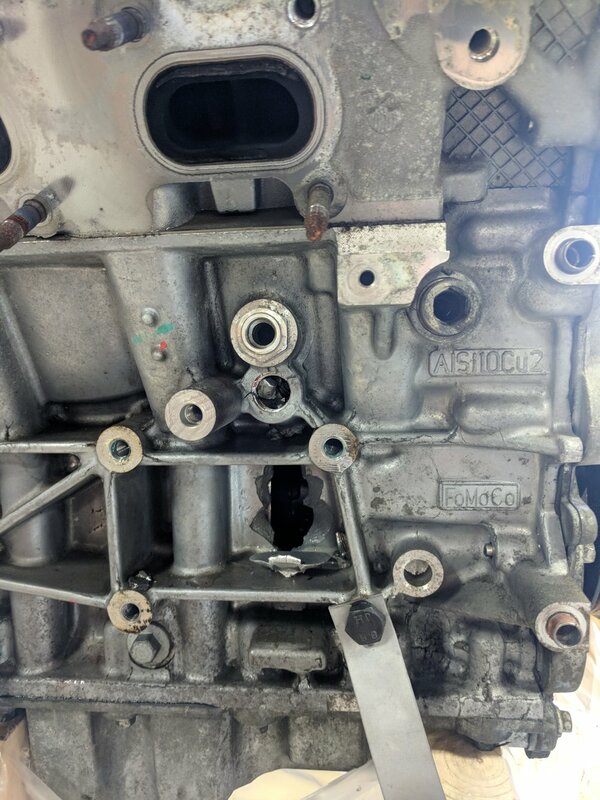 This particular engine had a severe mechanical failures resulting in a few of the internal components failing and trying to come through the side of the engine block! We took picture of the actual hole caused by this. With the engine frozen or "locked up" due to the failure it did add some difficulty to the removal process, but that was not an issue for our team. You can call on our expert technicians when you need anything from a simple oil change, to brake repairs, transmission service, wheel alignments or engine diagnostics. We do it all! Performing an engine replacement might be daunting for some mechanics, but not our ASE certified honest mechanics! Here you can see some in progress pictures of an engine replacement. It is a job where a mechanic must become one with machine! There are other auto repair shops around our area that have ASE certified mechanics, but we take it one step further. Our auto shop is recognized with the ASE Blue Seal Of Excellence! What does this mean for you? Simple. This means we deliver quality service and repairs EVERY time, and you never have to wonder about the skill or focus of the person working on your vehicle. ASE certifications show customers that our technicians know what they’re doing — and that they’re also a step above the average technician. That’s good for your peace of mind, and great for our business. Working with our employees become certified is also an excellent way to help them develop in their careers — and this increases employee loyalty. We want happy employees that enjoy being at work. A happy team means happy cars and satisfied customers. Because our shop has over 75% of technicians ASE certified, we have the earned privilege to be part of the Blue Seal of Excellence Recognition Program.